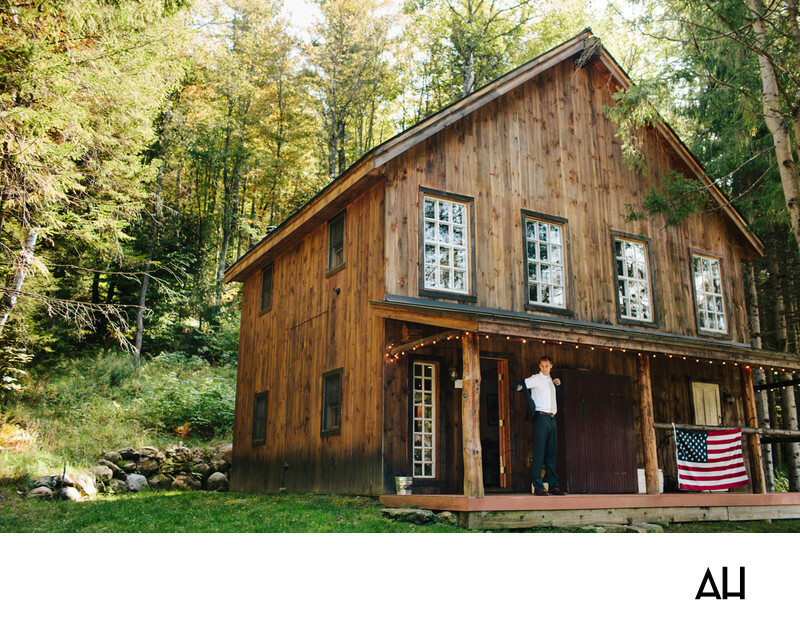 The Riverside Farm is a highly coveted Vermont wedding venue. Riverside Farm Wedding Pics always have a special charm to them that can only come from the the quaint setting of the farm’s grounds. Along with the extensive beauty of the land owned by the venue, the farm has seven fabulous barns for the bride, groom, and guests to make use of. This photo shows the groom standing outside of what is called the Groom’s Cabin. The authentic wood cabin is set on the edge of the property, next to a wooded area. It is tucked into a secluded spot on the farm and is a perfect place for the groom and his groomsmen to get ready for the wedding day. The cabin has been recently renovated and has all the amenities the men may need as they prepare for the celebrations to come. It gives the groom and the men who support him a place that is separate from the rest of the party, and is just rugged enough for a man who is about to say, “I do”. In the image above the cabin stands out, bold against the green backdrop of the trees. The sun shines down through the canopy of branches around the cabin. The groom has just walked out onto the porch, pulling his suit jacket on as he takes in the calming fresh air.